Mark Hinton is the Community Engagement Development Manager for CLL, as well as with the Community Engagement team of the University's central Engagement Group, He works with the third sector in the sub-region to raise awareness of opportunities for adult learners at the University of Warwick, to build long-term relationships between the University and communities across the region, and to encourage and facilitate good practice in University-Community Engagement. Mark is a Fellow of the Warwick International Higher Education Academy, with a focus on community-engaged and anti-racist pedagogies. He teaches Developing Community Leadership in a variety of community settings, and convenes an undergraduate interdisciplinary module, Community Engagement: Theory into Practice, developed with an Academic Fellowship from IATL. He co-leads a CLL module on Race, Power and Community, and still occasionally runs Clowning and Theatre Improvisation workshops. 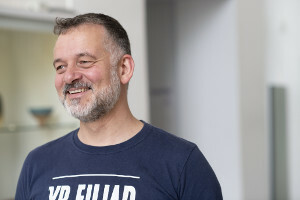 Mark has a BA in Drama, and before joining Warwick in 2013 already had 25 years’ experience working in community settings as an artist, a social entrepreneur, and a community engagement consultant. From 2005 to 2010, he was sponsored by the Joseph Rowntree Charitable Trust as a 'Visionary for a Just and Peaceful World' to develop innovative and effective new models of intercultural community bridge-building.